Much of the world has yet to modernize their financial services, leaving over 2 Billion underserved - we are out to change that. While running fintech apps for the last decade the team saw how costly, complex, and time consuming it was to build a financial platform. Hydrogen was founded to change this, exposing its light, modular, global REST APIs to firms small and large, with the goal of helping to digitize the world financial system. Hydrogen, or "water former" in greek, is the lightest and most abundant element on planet earth - #1 on Mendeleev's periodic table. It is an essential building block for life. The Hydrogen API was built to be a light, essential, financial building block, the ONE and only platform you will need to create fintech life. Our company mission is simple: Create a worldwide ecosystem for better, simpler, fairer, more transparent, and more affordable financial products. Hydrogen will create a new digital economy that will uplift and empower an emergent middle class, bringing fintech to the masses. 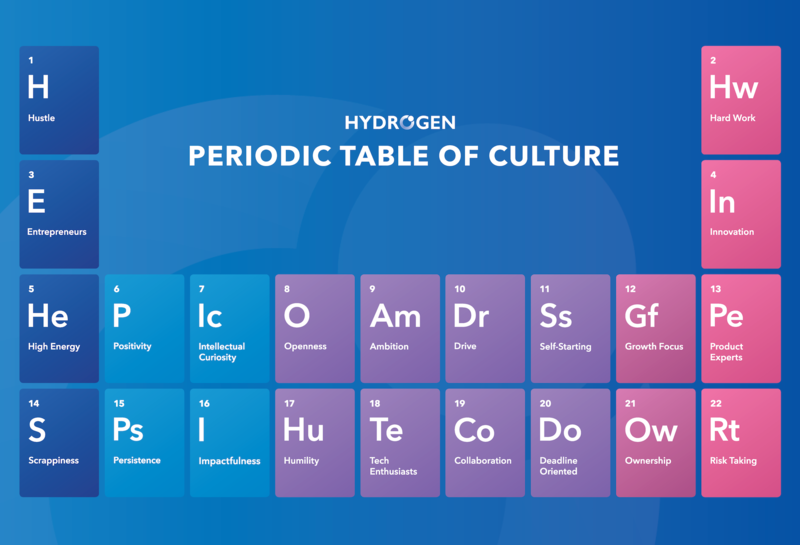 Our company culture is focused on a hard working, innovative, entrepreneurial mindset, which is best described through the "Hydrogen Periodic Table of Culture". To download official company information including descriptions, product screenshots, logos, awards, and team bios, view our brand kit. on a mission to change financial services. Looking to join the most innovative company in fintech?